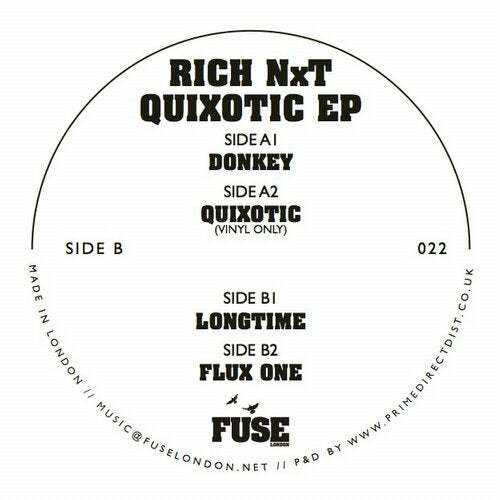 Next up from Fuse London is the latest EP from resident Rich NxT. Hot on the heels of launching his own NxT records, this scorching four track platter represents his strongest and most dancefloor FUSE London EP to date. 'Donkey', 'Quixotic' and 'Longtime' showcase an intricate yet effective sound, laced with powerful bass, sharp percussion, subtle synths, analogue dirt and bags of groove. All of the tracks have gained widespread support and captured ears around the globe whilst the dark, lurching 'Flux One' provides something a bit different.